What was once prominent in home décor and a fashion statement of the 70s, crochet is back in a big way and better than ever. 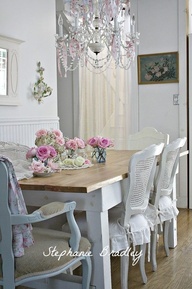 It is shabby cottage chic; bohemian, romantic prairie style and of course, vintage. 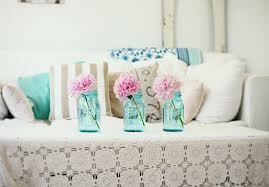 What used to be associated with ugly granny sofa covers and blankets, is now retro chic and gorgeous. Seen here in dresses, curtains, revamped sofa covers and more vintage style repurposed diy crafts, crochet fabrics are everywhere. Are you groovin’ on this hot trend? 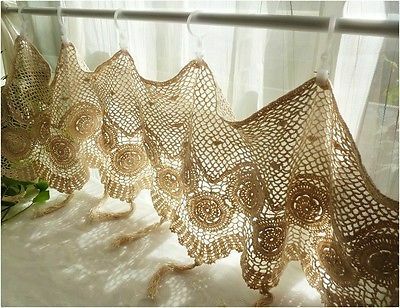 A traditional vintage crochet valance lets plenty of light shine in creating an airy, romantic window dressing. This crochet tablecloth, updated with repurposed aqua mason jar vases each holding a single flower, proves that beauty is in simplicity. 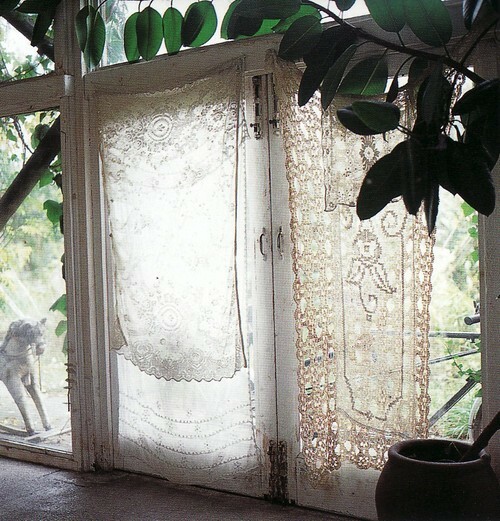 Vintage tablecloths repurposed as curtains create a bohemian vibe as they welcome visitors into this home. 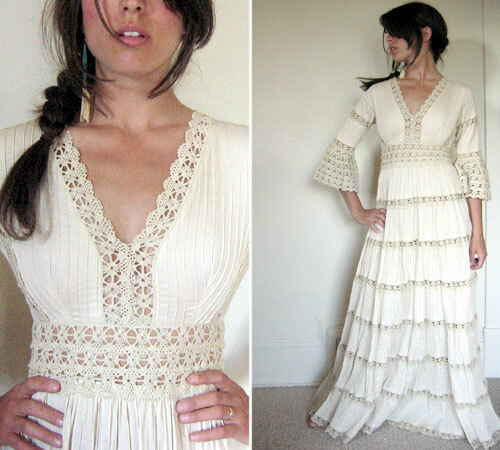 This casual crochet dress is very reminiscent of the 70s; All she needs is a flower tucked in her hair. Groovy. Crochet fashion isn’t just for the beach – paired with a tulle and floral veil, crochet takes center stage at summer weddings (Above and below). Crochet and lace – what could be more romantic on the runway? One of my favorite closet/bedroom pics – the crochet bedspread and tea stained crochet blanket draped over the bed sitting atop white washed wood floors, this bedroom is the ultimate in prairie romantic chic. 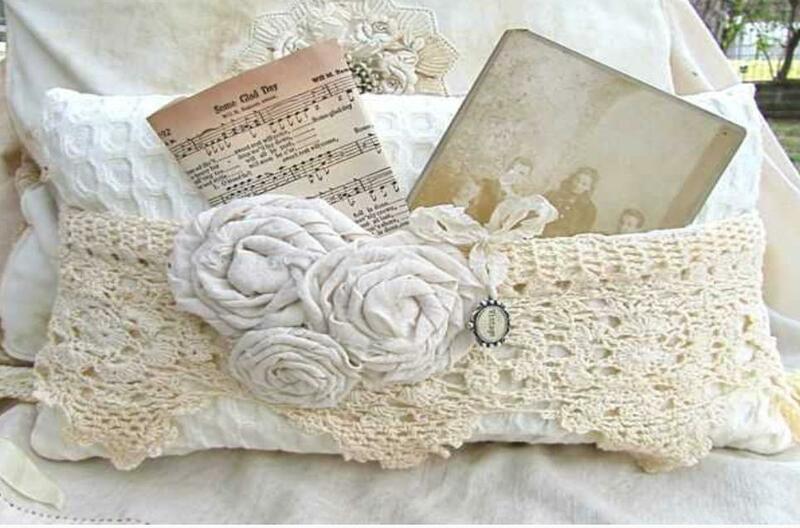 This DIY-er transformed a tablecloth or doily into a gorgeous basket filled with vintage photos and sheet music. Gone are the days of crochet blankets hung on the back of sofas in 70s greens, yellows, oranges and browns. 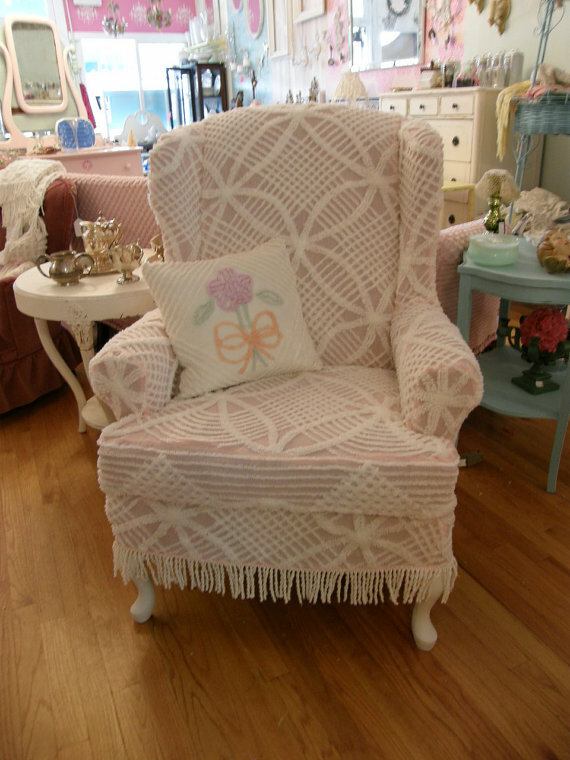 Gorgeous shabby cottage chic covers adorn this sofa and wing chair by sewing white crochet, chenille and floral fabrics together. 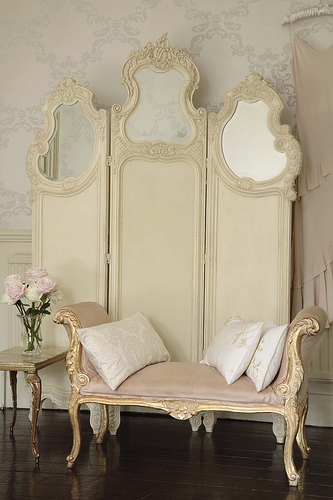 In honor of Bastille Day this past weekend, marking the beginning of the French revolution, I thought I wanted dedicate a post to celebrating the glamour and beauty of French inspired home interiors. Je t’aime Paris! 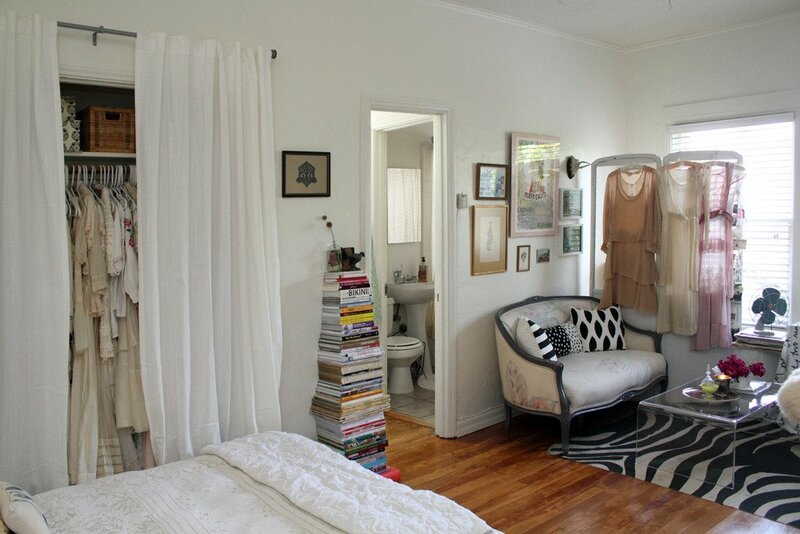 I live in a small apartment so I am always scoping out ideas for spacious organization tips and chic decoration trends. I especially love vintage décor and anything with a French flair or Parisian influence that will make my studio feel more like a home. – Divide and conquer. Divide your apartment into livable sections. With limited space, you really want to take into consideration the things you will do at home on a daily basis and the things you have aquired that you need to store or display (You know, the stuff you just can’t bear to love without. The rest should be sent to Goodwill .) 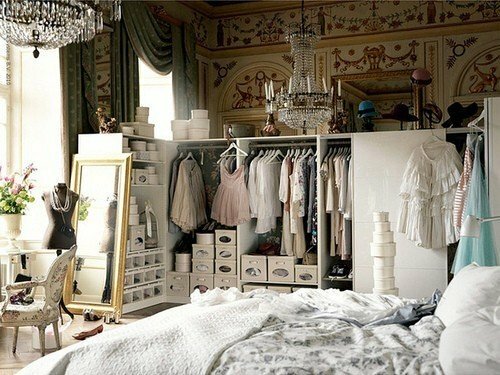 For me, not including the kitchen and bath, this entails (1) a closet/vantiy area, (2) a living room area and a (3) bed(room). 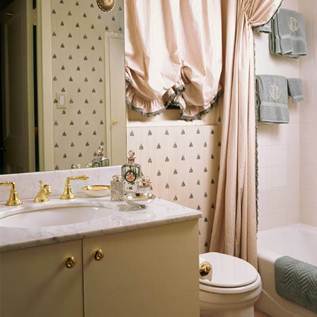 – Do double-duty using multipurpose furniture and accessories. My favorite – an ottomon (any size, shape or fabric – as long as it has a lift up top) and vintage steamer trunks. Both can serve as an alternative to a coffee table, extra seating and storage. – And NEVER sacrifice style – no matter what size space you have. 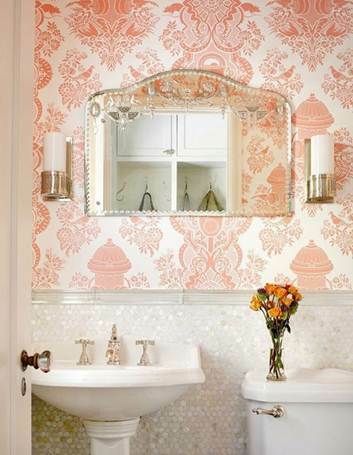 Here are some of my absolute favorite designs, layouts and inspiration photos! Hope you find something to inspire you! I have always loved sleeping in closed quarters. It feels like I’m in a cocoon, safe, serene, comfy and in my own personal bliss. 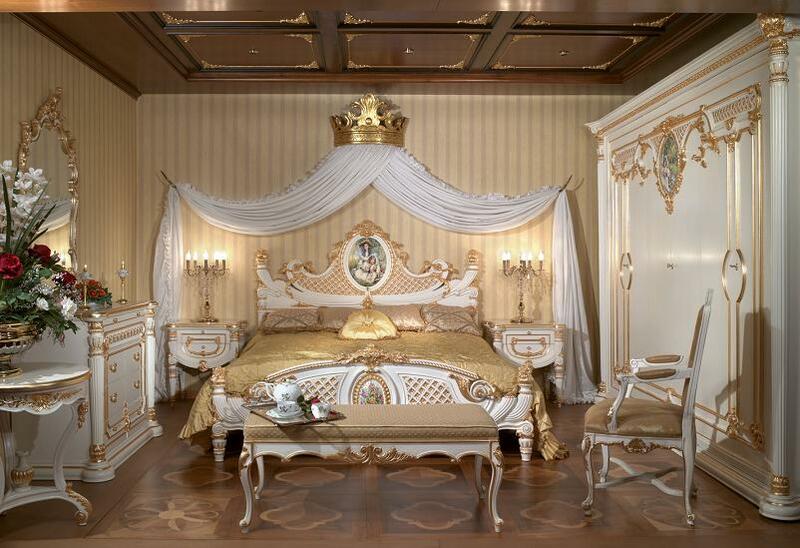 Exactly the kind of feelings I think one should associate with their bedroom. I tend to defy the traditional philosophies of feng shui, often preferring to have my bad smack dab up against a wall in a corner of the room. Even more so in my current “bedroom” of my studio apartment, my bed is sandwiched between two windows, not centered, not equally distant to any one side or another, but more of in a zig zag formation, one at the left foot of the bed and the other at the top, right of the bed – like a Z. 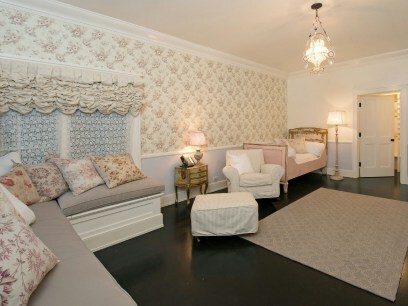 But my bed added to this corner of the room, creates the perfect nook for sleeping, far enough away from the door and hidden by a wall from the kitchen, so as to seem like its very own space. To make my bed(room) even cozier, I created a DIY canopy out of floor length velvet plum drapes attached to the ceiling with magnetic curtain rods that frame the long side of my bed. The curtains plus the three walls envelope my bed on all sides and serve to create the feeling of a separate room in what would otherwise be a one room studio. 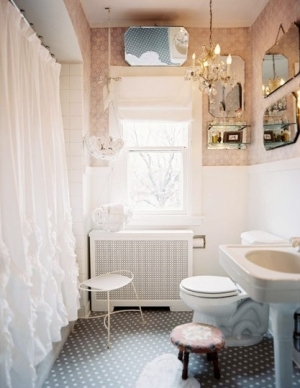 The look is elegant, chic and very Paris apartment style. I am always looking for ways to make it even more dramatic. 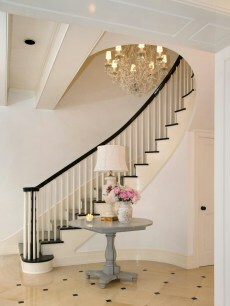 These are some of my favorites interior design ideas that I have gathered from the Internet, below. 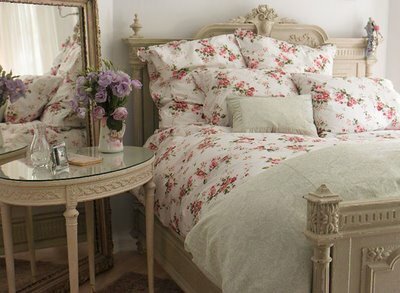 How do you make your bedroom romantic or serene? Share your ideas here! 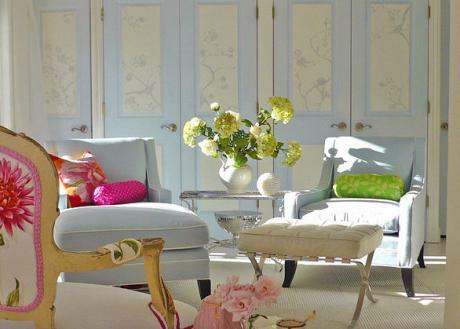 One of my favorite designers and interior design entrepreneurs on the West Coast is Rachel Ashwell – best known for coining the décor trend and brand Shabby Chic. 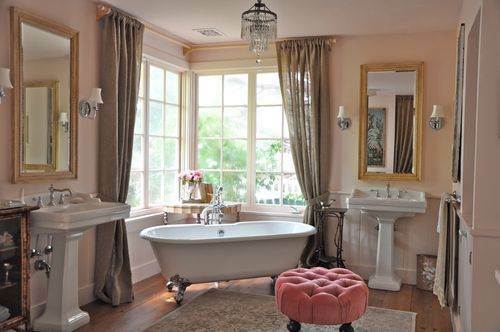 She grew an empire out of creating homes that were “comfortable, cozy, vintage and pretty” according to an Inc. report on her rise to retail fame. 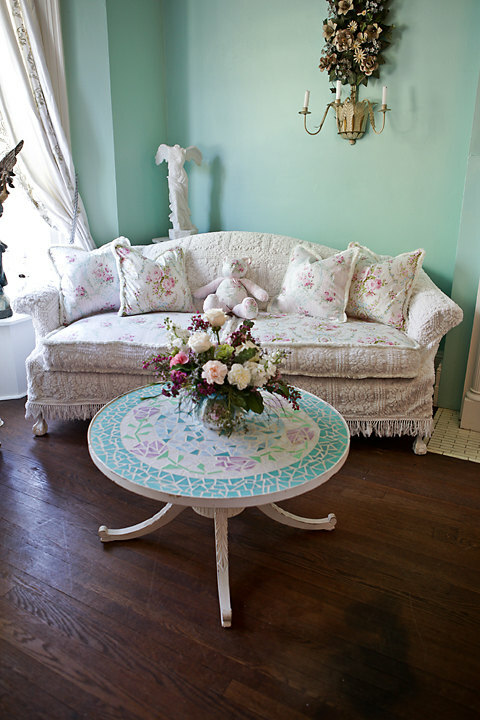 Her handpicked furniture, linens and accessories are predominantly white mixed with soft blues, greens, pinks. 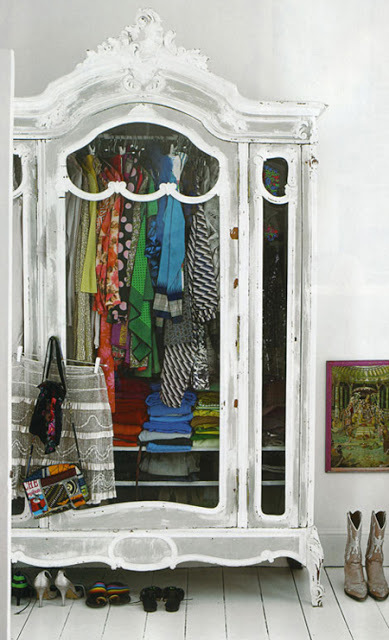 As the name suggests, Shabby Chic exudes an unexpected juxtaposition – in her collection you can find a mix of old with new, florals with stripes and the refined with the slightly tattered – but everything is beautiful. I adore the feminine elegance she brings to every collection yet at the same time it is not so feminine that a man wouldn’t find comfort in it as well. 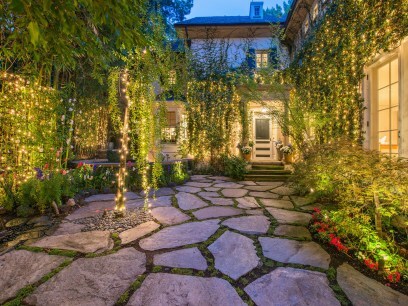 I recently saw an article on a Beverly Hills home on the market, currently owned by reality star Jessica Simpson and football hubby, Eric Johnson. 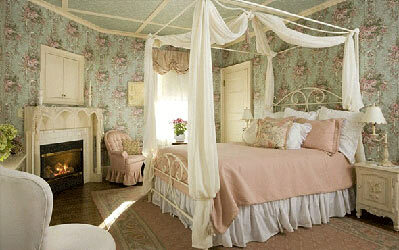 Its recent renovations, designed by the Queen of Shabby Chic, Rachel Ashwell, are absolutely stunning! 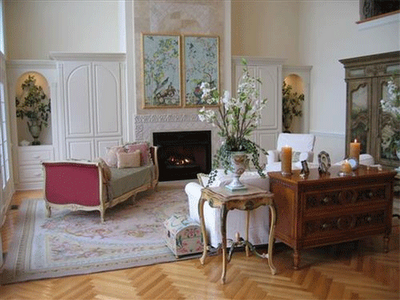 Here are some of the pics I grabbed from the Sotheby’s listing. 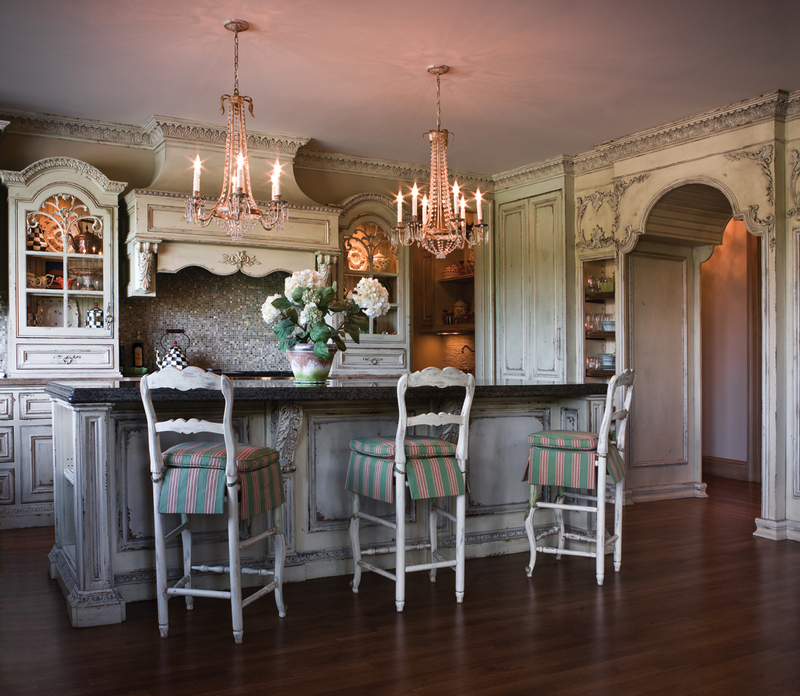 There are countless chandeliers and oh so chic french inspired furnishings! 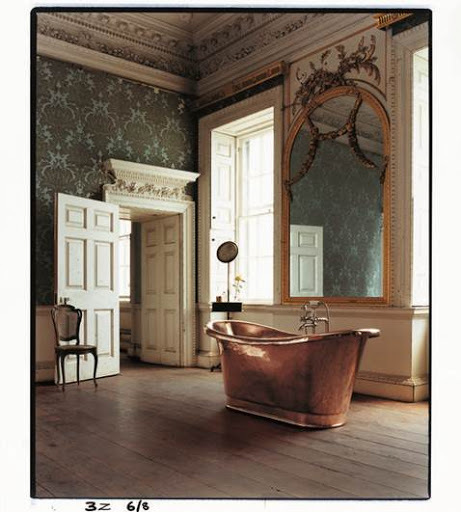 If money were no object, who would you have design your home? And what would it look like? Share here! 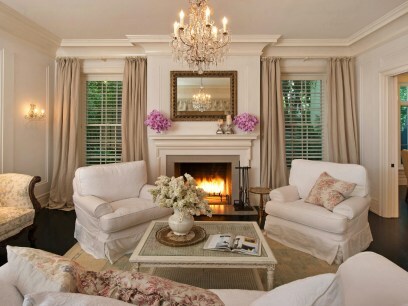 Welcome to Tres Chic Decor! I am so excited to announce my new venture in the flea market/antique business, having moved my online business to a brick and mortar store! 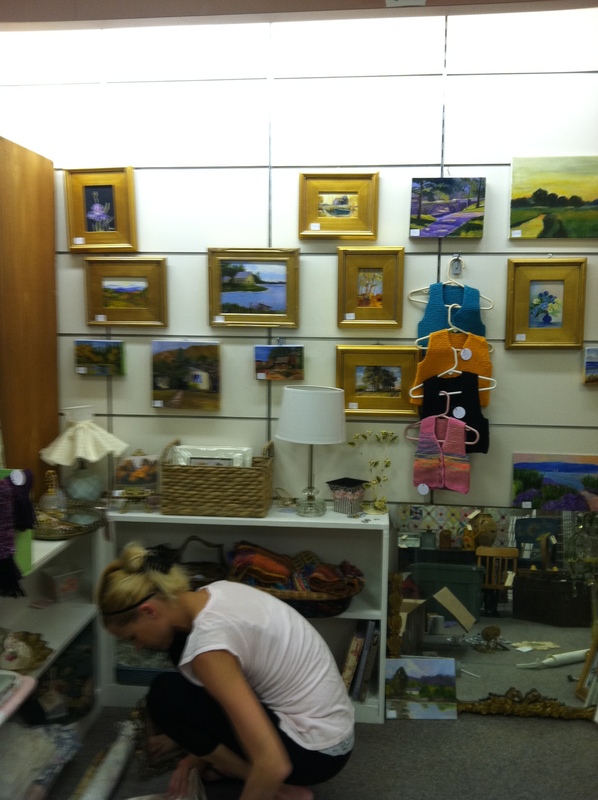 I am currently sharing a booth with a friend who is an artist and creator who paints with oil, knits scarves, sweaters and makes jewelry. My inventory is made up of vintage home décor treasures and finds with a little of everything, from smaller items like china dishes, painted frames and vanity trinkets to small furnishings, like lamps, rugs and chairs. We added a sampling of our inventory into the booth this past Sunday and with much more inventory to be priced for sale and brought to the booth, I am currently seeking ideas for ways to organize the booth to optimize our inventory and selling potential. I don’t have too much furniture yet; namely a Full/Queen head and footboard, a large 12 light rococo chandelier, a hanging pendant milk glass chandelier, a Victorian heart back chair and several “to be refinished” projects, from tables to footstools. Among a wide assortment of home decorating accessories, I have lot of frames, mirrors, fabric curtains, books, wall sconces and more. This is a picture of our booth when we were beginning to set up. Based on what I have in stock and what my partner has displayed, these are some of my favorite inspiration photos for organizing the booth. 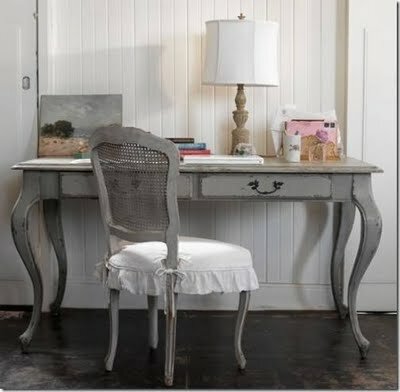 Think Shabby Cottage Chic meets Paris Apartment! 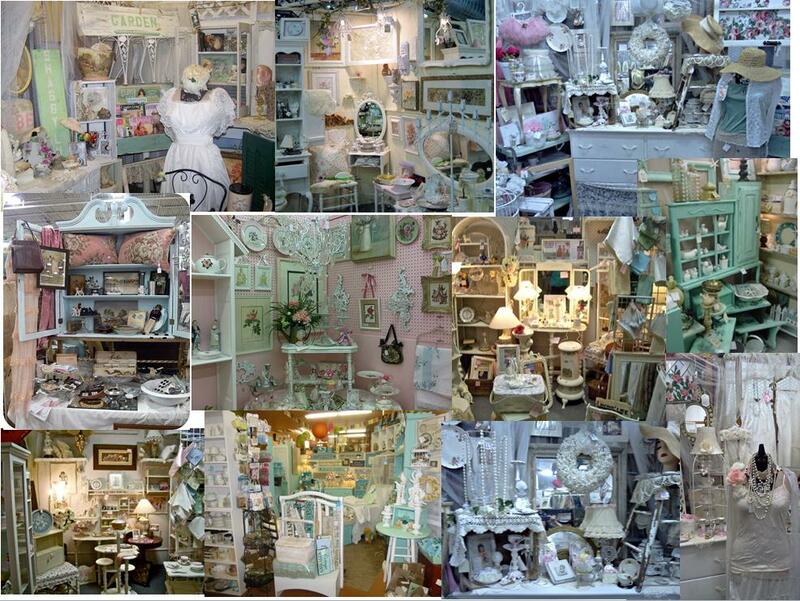 Do you have any great organization or display ideas for antique and/or flea market booths? Let me know. I’d love to hear your ideas and experience. 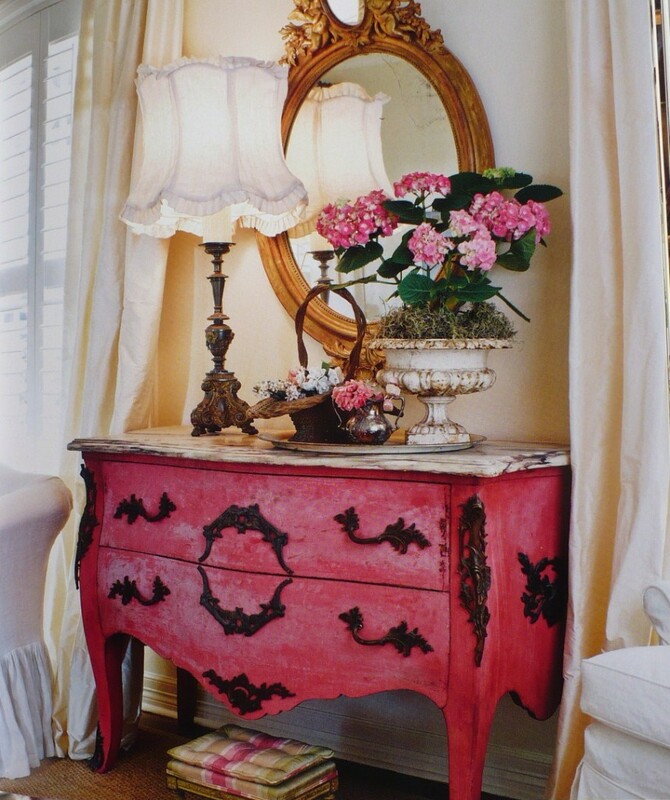 With Spring in the air, colors are coming out everywhere and I’m looking for ways to bring them into my home. 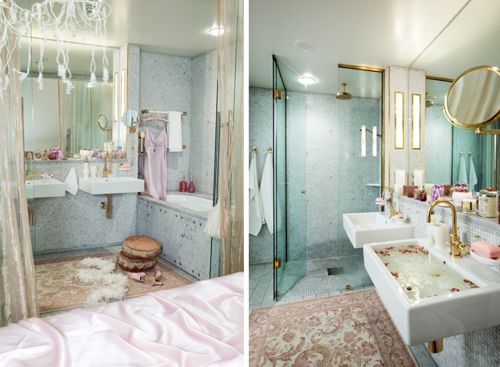 Right now I’m looking into ways of adding some light and fun into my bathroom and I am loving pale colors mixed with summery brights, like coral with grey or lilac with teal. My favorite of the pales right now is a soft ballet pink. 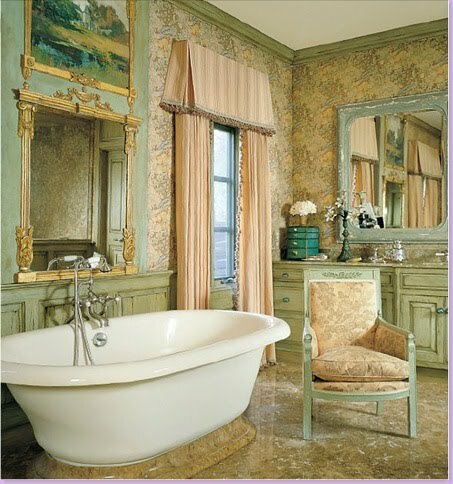 Look how different it can look paired with alternate colors in these inspiration photos I found to recreate a Glam Parisian Rococo style bath. Looking for more inspiration photos like these? Check out the new function in Google Images to be able to search for Visually Similar images by a single photo. I am Obessed! Go to Google, click on Images. An icon of a camera will appear in the right side of the search bar. Click on the camera icon and then upload your image. Watch and see all the beautiful images that transpire before your eyes. Try it yourself! 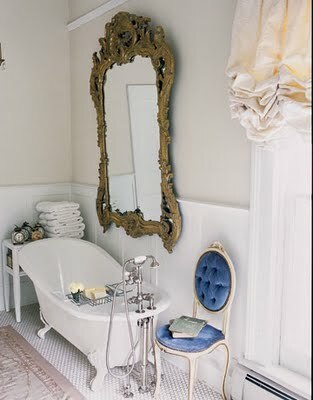 Take any of the images from my post, save them to your computer and then upload them into a search in Google images to see more inspiring photos for your next decorating project.